Successfully Added Color Changing LED Light Bulb "iSunroad" - 9 Watt, 420 Lumens, 2 Million Colors, Remote Controlled to your Shopping Cart. 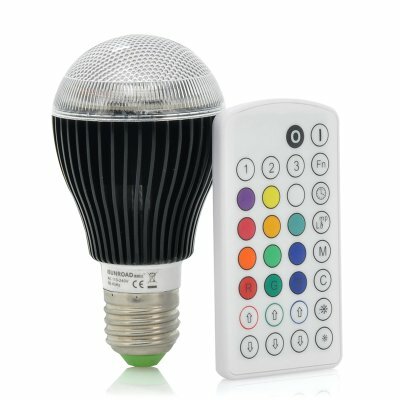 9 Watt Color Changing LED Light Bulb emitting 420 Lumens and 2 Million Colors Hues using the Remote Control. Set the mood with this Color Light Bulb. Fitting in your normal light socket, the “iSunroad” LED light bulb will not only illuminate the room like any other light bulb, you’ll also be able to choose from over 2 million different color hues using the remote controller. Take that, incandescent light bulbs! 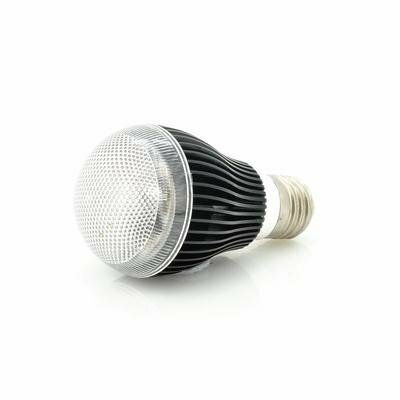 9 Watt strong and emitting 420 lumens, this LED light bulb can easily replace your regular light bulbs while saving you up to 90 percent more energy compared to incandescent bulbs and up to 30 percent compared to other LED lights. Use the wireless remote control to switch between different colors to set the mood and 120 brightness levels can be selected. On top of that, the “iSunroad” bulb comes with a unique music control function allowing it to automatically change color and brightness according to the rhythm and melody of the music. When switched off, the “iSunroad” will memorize the last color setting, brightness and flashing pattern and automatically switch back to it when turned on again. This colorful LED light bulb is now in stock and can be shipped out within 1 working day. Brought to you by the leader in wholesale LED lightning, Chinavasion. A single lamp but can give different colour lights that too with different intensities and a lot of modes to operate it. Much much cheaper than similar product from Philips. Everything came well packed and operational.